Since that time, SUNY continues to do everything in their power to halt all services at Long Island College Hospital (LICH), despite multiple court orders. After setting an initial date of July 15 for the contempt hearing, Judge Baynes set a conference date for the following Monday, June 24 to ensure that SUNY did not discontinued ambulatory services at LICH. The hospital was to be restaffed and running as it had been the day he originally issued the temporary restraining order (TRO) on February 20, 2013. 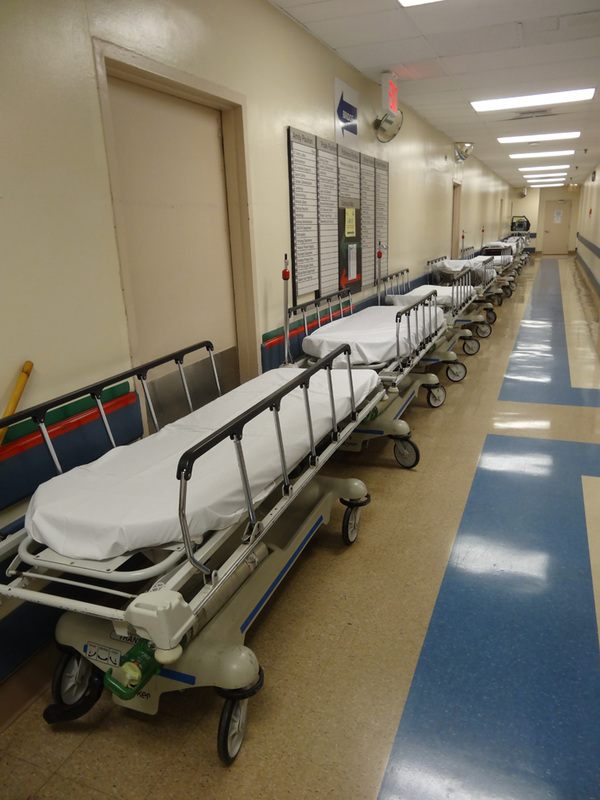 Some of the empty beds that litter the hallways of LICH since SUNY has closed the hospital to new admissions. One ambulance picked up a 60 year old male in critical condition in Coney Island who needed a bed in Intensive Care Unit (ICU). The patient was transported to Richmond County Hospital in Staten Island because every available ICU bed in Brooklyn was filled – except LICH. SUNY claims the move to divert ambulatory services and discontinue admissions at LICH was due to inadequate staffing. DOH requires one nurse for every two ICU patients. While ambulances were overcrowding other Brooklyn hospitals, seven ICU nurses and two resident doctors were working at LICH with only ten ICU patients. The fifteen bed unit could have taken up to four more patients. But because of the diversion, ambulances were forced to take ICU and emergency patients across bridges and through tunnels into Manhattan, Staten Island and Queens. Several Brooklyn hospitals requested temporary diversions because their patient loads were too large. But 911 services refused to grant the diversions because all of the hospitals were under the same duress. In less than 24 hours, the LICH diversion had created crises at nearly every Brooklyn hospital. In addition, SUNY also began transferring patients out of LICH. In another letter also dated June 20 from George Caralis, Interim Chief Executive Officer from SUNY, stated, “Effective immediately, patients will be transferred out of the critical care units (ICU/CCU) and for the foreseeable future, no further patients will be admitted to those units.” Critical Care patients were being transported as far away as New York Presbyterian at Columbia University – nearly 15 miles away. The first patient was relocated Thursday afternoon. Julie Semente, a LICH registered nurse and NYSNA member, wrote, “I can tell you first hand that NO NURSES are fleeing LICH […] The emergency room manager did leave. However, there is a qualified candidate ready and willing to take the job, but Downstate won’t fill the position. It serves their purpose to leave it empty. DOH confirmed what doctors and nurses have been saying all along. They reported back to the Kings County Supreme Court that LICH is staffed up to appropriate levels and should resume all services. They have been assessing staffing levels on a daily basis since June 19. LICH continues to be fully staffed – with the exception of the residents SUNY pulled back to their downstate campus late last week. In fact, the ICU unit was staffed with five nurses for only three patients. That same Thursday, James Karkenny, acting COO of LICH and representative from Pitts Management, tried to give ICU nurses and award they had won in March for exemplary care – the same day SUNY told the nursing staff, “we’re emptying the place out.” The Vice President of the nursing staff warned him that his timing was inappropriate. This was not the first year LICH nurses had won this award. ICU nurses told stories about a fancy dinner wearing corsages, and the pride they felt in earning the recognition. A banner and plaque were awarded for the nurses to proudly display. But this year’s award was an insult to injury. By Saturday evening, only three patients remained in ICU, while CCU had completely been dissolved. The 5th floor CCU unit’s door had been padlocked. Six nurses in ICU were capable of taking care of twelve patients. CCU nurses were moved down to help out in the ER. Over the weekend, LICH’s emergency room remained busy. Walk-ins came from other hospitals via taxi, buses or on foot to avoid the outrageous wait times at other hospitals. One woman said she waited in an ER for 36 hours without being seen before going to LICH. Five cardiac patients that came to LICH’s ER all had to be transferred out. One was sent to Queens, and his family had to track him down. Saturday was also the last day resident doctors were still in place. One resident expressed concern about beginning her third year in a new hospital. Others seemed distressed about being transferred back to the SUNY campuses and worried about the effectiveness of their training. Monday afternoon, Judge Baynes held a conference with SUNY, LICH and DOH lawyers. The meeting was closed to community resident, nurses, doctors and media. However, LICH lawyers met with multiple media outlets after the conference with concerned optimism. Judge Baynes insisted SUNY remove the diversion immediately and begin readmitting patients at LICH. He gave SUNY a noon deadline the following day, Tuesday, to report back that services had been fully restored. By this time, the residents had already been relocated and SUNY expressed concern of doctor shortages. SUNY would need to have physician’s assistants (PAs), intensivists and nurse practioners (NPs) in place before they could fully reopen the doors of LICH. They anticipated this would take until Thursday, Friday, or even as late as Monday, July 1. SUNY released a statement prolonging the ambulatory diversion, continuation of patient transfer and no longer scheduling elective major surgeries. Admissions, the memo said, would be allowed only through the admitting office, not the ER. After closing the unit and refusing admission to patients, SUNY then turned the tables and blamed lack of patients for the unit closure. Another memo from George Caralis, Interim Chief Executive Officer, stated all inpatient admissions to “require review and authorization by the Chief Medical Officer, Dr. Michael Lucchesi. No patients will be admitted unless approved by the Chief Medical Officer.” To date, not one patient has been “approved” or admitted by Lucchesi. Tuesday night, CCU was still closed. ICU had only three patients remaining with six nurses and one doctor on the unit. Walk-ins continued to keep the ER busy with more than 60 patients a day. On Wednesday, DOH announced that they were continuing to allow the diversion, but were slowly lifting it in a controlled way until the residents had been fully replaced. On Thursday, June 27, Judge William Thompson, Sr. was appointed to oversee hospital operations at LICH. Judge Baynes appointed Thompson to ensure compliance with his court order to restore services and restaff the hospital as they were on February 20, 2013. There has also been talk of the residency program being restored under Thompson’s authority. Thompson is a retired Appellate Court Judge, and has also served in the New York State Senate and the New York City Council. In the meantime, SUNY has closed multiple more units in the hospital each day. One nurse commented it would be easier to list the floors that are still open. On Friday, June 28, three more units – Arrhythmia, the Coronary Catheter and EP units were shut down. Patients that were scheduled for procedures within those departments had to reschedule elsewhere. Dr. Niki Hurt has been hired as an intensivist. According to Dr. Leonard Navarro, head doctor of LICH’s ICU unit, Dr. Hurt is “perfectly capable” of overseeing the entire ICU department along with the fully staffed unit. However, patients are still being transferred out on a daily basis – most being sent to SUNY. One patient required a surgery that LICH is capable of performing and always has, but SUNY is not. He was sent to Lennox Hill in Manhattan for the procedure. By Monday, ambulatory services are supposed to be restored and LICH able to admit patients. Monday will also be Judge Thompson’s first day on site. However, SUNY spent most of the weekend closing floors, transferring patients, polishing the floors and repainting. The Star-Revue received a letter from a LICH nurse who wished to be unnamed. In the letter, the nurse describes the current conditions of the hospital. “Unfortunately SUNY Downstate rolls full steam ahead with no regard for judges or special masters. There’s maybe 60 patients in a hospital that had averaged about 240 every year for about 2 years. We are sitting in empty units 12 hours a day, but the nurses are coming to work every day. “Only the DOH can close a hospital. They have found no deficiencies to warrant closure. They sent an affidavit to the judge stating that the ambulance diversions should be lifted gradually. SUNY refuses and continues to close down the rest of the hospital. “In the meantime, [Thursday] the 8th floor (medical), 9th floor (psychiatry), 10th floor (surgery), 11th floor (neurosurgery and stroke unit), St51 (step down cardiac), and Labor/Delivery are all emptied out of patients. Obstetrical deliveries have been banned except for emergencies. But the nursing staff are all still there. For instance, ICU had 6 RNs on duty with 2 nursing aides and just 3 patients (2 of them being prepared for transfer to another hospital). “Pediatrics and maternity are empty and no further admissions are allowed. In 2008, when Continuum tried to close those units, the DOH refused to allow it, saying that the services were “vital” to the community. The pediatric and maternal population has exploded in the area since then. If those services were vital then, they are even more vital now. Yet, without the DOH permission or approval, and without regard for the needs/demands of the community, these services are already shut down. “The cardiac unit is closed and has a padlock newly installed on the door. A PADLOCK! As a slap in the face to the chief of cardiology, a security camera was installed at the door of his office to keep an eye on him. They’re being installed all over the hospital too. “The cardiac catheterization center, which had the best door-to-doctor times in the borough, is now closed except to in-house emergencies. Surgeries have been blocked too. The attending physicians cannot admit their patients, not through the emergency room and now not even through the admitting office. “Armed university police are suddenly patrolling LICH. “The entire in-patient hospital is basically closed. Only the walk-in ER and out-patient testing like the endoscopy lab (for things like colonoscopy) is being allowed. They have turned this 155 year old premiere medical teaching facility into a walk-in clinic practically overnight. Every day the picture changes a little bit as SUNY defies court orders, ignores directives from DOH and manipulates LICH closer and closer to closure. But the hospital staff is not deterred. They are all still there, outnumbering the patients almost two to one. “Last week a 13 year old boy collapsed in his classroom. Quick action by his teacher and school nurse brought immediate attention by the Long Island College Hospital ambulance teams that cruise LICH catchment neighborhoods. “The child was in full cardiac arrest, was brought back to life by LICH paramedics after shocking his heart 4 times and administering emergency medications. The child was in the LICH emergency room within 2 minutes, where the cardiology doctors and nurses took over, started hypothermia treatment and rushed him up to the 5th floor cardiac angioplasty center for cardiac catheterization. 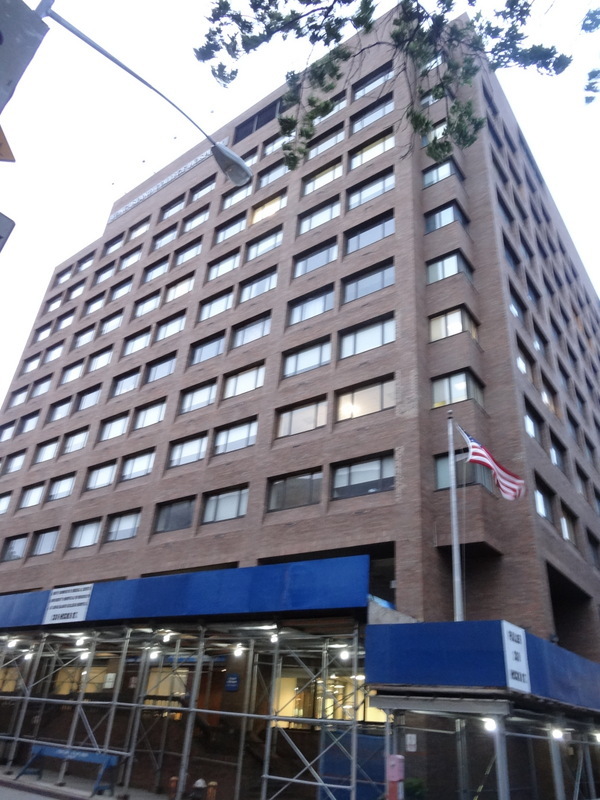 Afterwards, the child was stabilized in the LICH Cardiac Critical Care Unit before being transferred to a Manhattan pediatric unit to recuperate. Without these vital services in our communities, lives will certainly be lost. Every single one of the units and medical services provided that day have been discontinued by SUNY’s ultimate determination to destroy LICH. This entry was posted in LICH and tagged Julia Semente, LICh, Long Island College Hospital, Spits, SUNY Downstate. Bookmark the permalink. I appreciate this article by Kimberly Gail Price. It is really hard to hear about what is happening at LICH. However, the quotes about Lutheran Medical Center are not accurate. On Thursday, June 20th, Lutheran Medical Center did not have 8-9 hour waits in the ER as stated in the article. The average door to doctor time was 29 minutes on this date, and had below average ER visits on that date. So far Lutheran has not been impacted by LICH going on total diversion as described in this article and is not experiencing the “total chaos” as stated by Ms. Price. Thank you for that Dr Tucker Woods, formerly of LICH ER. Glad to hear that you are not experiencing total chaos over on your end of Brooklyn. Is that all you have to say about the crisis that has unnecessarily been created at this end of Brooklyn? If you cant say anything to help, maybe you could take up a collection for you colleagues, the Concerned Physicians of LICH, to contribute to their legal fund as they fight to be able to continue to provide their patients at this end of Brooklyn with the same kind of quality care that you no doubt are able to provide to yours. I think it was Brooklyn hospital & Methodist that were most immediately impacted on that date. LICH patients keep coming to LICH. They don’t want to go anywhere else. SUNY was waiting for them to “stop coming due to the uncertainty of LICHs future” but they didn’t! So SUNY kidnapped them – pulling LICH patients out of their beds from units all over the hospital (not just critical care), transferring just about ALL of our patients to other hospitals and stopping ambulances and LICH admitting office from bringing new patients to LICH. But the staff is still there and the patients are getting in cabs & getting driven to LICH to “walk-in”. The community wants & Needs LICH. Period.